This page describes customizing an existing Library Survey. If you’d rather build a survey from scratch, please see Creating a New Internal Survey or Creating a New Public Survey. Each TIM Tools instance comes with a starter collection of surveys created by FCIT with topics such as school volunteers, end-of-year tech checklist, cyberbullying, workshop evaluations, or home technology use. 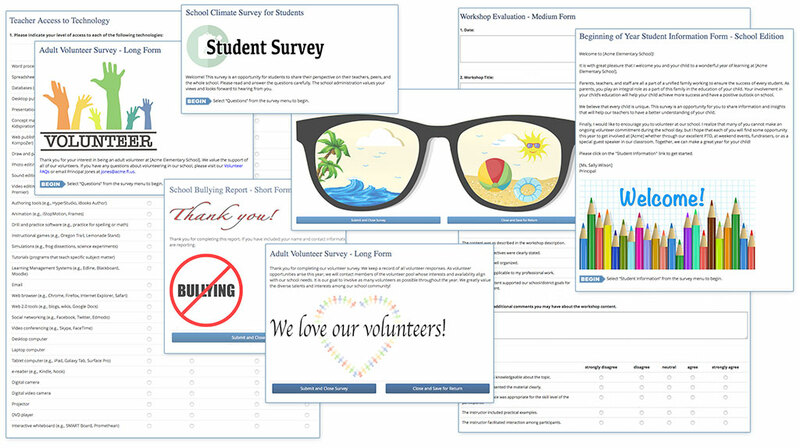 These surveys can be immediately used just as they are or they can be easily edited to customize them specifically for your school or district. Many of the surveys include some notes to the survey creator regarding customization right in the Introduction text. You’ll want to delete the customization notes before publishing the survey, of course. Figure 1. Portion of the included Survey Library. 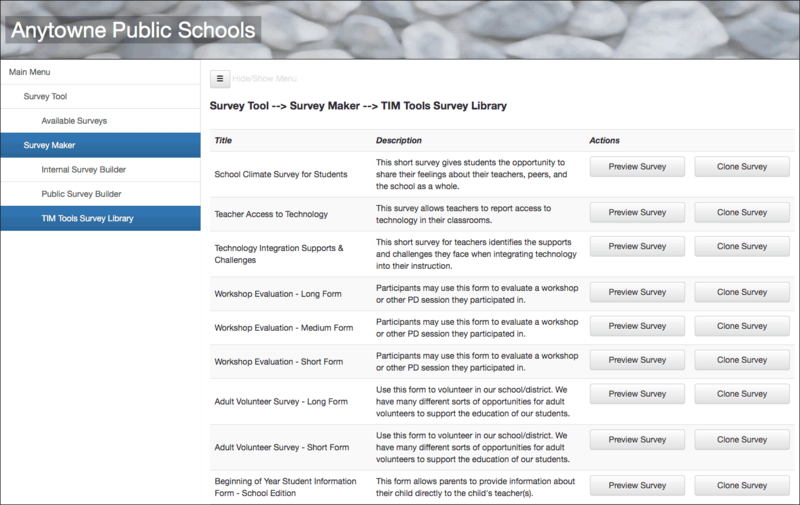 From the main menu, select Survey Tool > Survey Maker > TIM Tools Survey Library. You will see a list of titles and descriptions of surveys in the library. 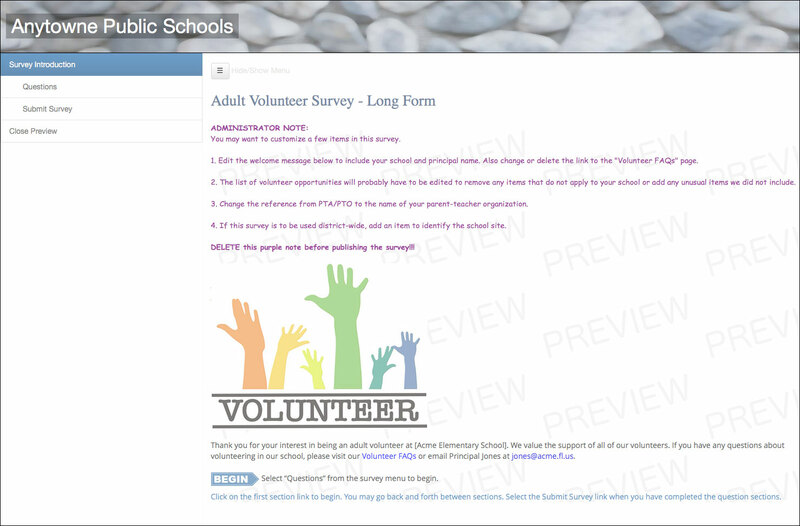 Use the Preview Survey button to view any of the surveys that you are interested in. Once you have found a survey that you would like to customize, click the Clone Survey button. 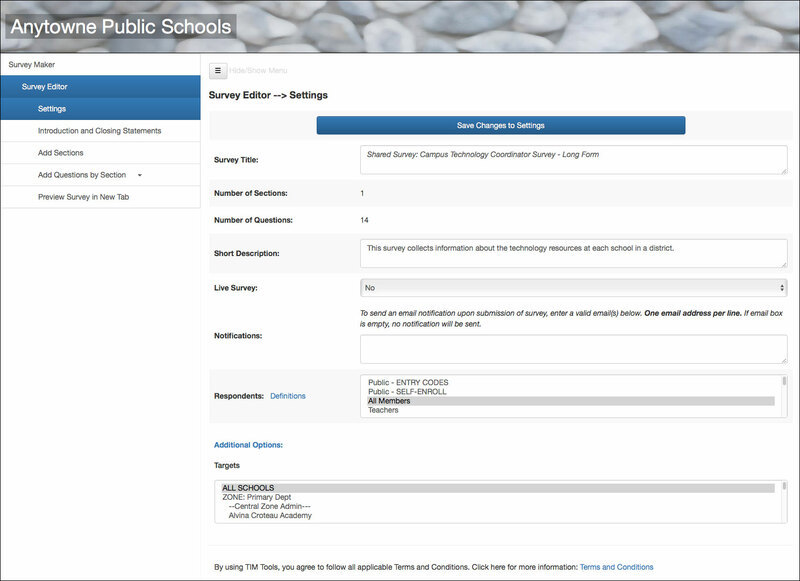 A copy of the selected survey will be added to the Internal Survey Builder tab where you can begin editing it. All cloned surveys will have “Shared Survey:” appended to the title to indicate that it has been shared from the Survey Library. You can rename the survey to anything you wish once you open it in the editor. In the Internal Survey Builder window, click the Edit Survey button for the survey you have just cloned. Survey Title. The Survey Title will be the same as you saw in the Library, but with “Shared Survey:” appended to the front to distinguish it. You can edit the title if you wish. In any case, you’ll probably want to delete the “Shared Survey:” part now that you are customizing it yourself. Short Description. The Short Description will appear next to your survey title in the Available Surveys list. You can edit this if your wish. Respondents. You can set Respondents to either “Public – ENTRY CODES” or to “Public – SELF-ENROL” or to any combination of member roles. Any survey taken by a member of the public will be tagged with their IP address to allow the filtering of duplicate responses if desired. Surveys taken by members will be tagged with their member ID. • Public – Entry Codes. The title of a survey with this option will be visible to anyone who knows the URL of your TIM Tools public home page. However, only persons with a special code set by the survey creater will be able to enter the survey. You can create as many different codes for a survey as you would like. For example, you might distribute various codes to parents according to the school of their child. 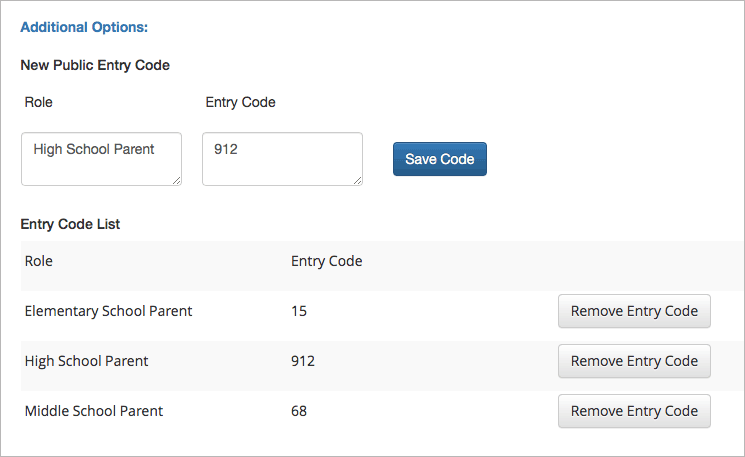 Or you may use different codes to identify groups of non-teaching staff that are not entered into your TIM Tools instance. You could distribute one code to custodial staff, another to office staff, another to bus drivers, etc. • Public – Self-Enroll. Anyone who knows the URL of your TIM Tools public home page will be able to participate in a survey with this option. Participants create their own unique code for entry into survey, which allows the particpant to return multiple times until the survey is submitted. If you select either of the public options, the next time you return to edit the survey, you’ll find that it has been moved to the Public Survey Builder so that members with access only to internal surveys cannot edit or view responses from it. • Member Roles. If you intend for this to be an internal survey, then select the member role or roles you wish to include. Once you have selected at least one internal role in the Respondents selector, an additional option for Targets will appear below. Targets. When the Targets option appears, you can select whatever combination of schools or zones where you want the members to respond to the survey. If you have set up zones in your instance, the schools will be arranged alphabetically within each zone. If you have only the one default zone, the schools will appear as a single alphabetical list. Figure 4. Two high schools selected as targets for the survey. The first screen participants will see is the Introduction screen. Make any changes you’d like to the Introduction text. NOTE: Many of the surveys from the Library have an “Administrator Note” at the top of the Introduction window. These notes suggest things to consider when customizing the survey. They appear as an obnoxious purple Comic Sans font in previews to remind you to delete the note. The suggestions are not intended for publication as a part of your edited survey. Figure 5. Previewing a survey. The ugly purple text contains suggestions for the survey editor. This section should be deleted before the survey is made live. You can also add any image that you’ve uploaded to the Web by using standard HTML code: <IMG SRC=”YourURL”>. We’ve already uploaded a nice collection of welcome, thank-you, and prompt images you can use in survey construction. View these images at https://fcit.usf.edu/matrix/project/survey-parts-and-pieces/. The final screen participants will see is the Closing screen. Make any changes you’d like to the existing closing statement. As with the Introduction screen, you can use standard HTML to mark up your text and add images. When you’re finished with the Introduction and Closing Statements, click the Save Changes to Introductionbutton and then select Add Sections from the Survey Maker menu. Use this form to volunteer in our school/district. We have many different sorts of opportunities for adult volunteers to support the education of our students. This form allows parents to provide information about their child directly to the child’s teacher. This survey collects information about the technology resources at each school in a district. This form is for reporting cyberbullying only. For reporting incidents of other types of bullying or incidents that combine cyberbullying with other other types, please use one of the other available report forms. Classroom technology checklist to be completed by teachers before summer vacation. This survey allows parents and guardians to provide feedback regarding our family-school partnership. This survey provides important information to a school or district about the level of technology access in their students’ homes. Observers can use this form to record mentoring sessions. Use this quick poll to find best days/times for meetings, calls, and other events. Use this quick poll to find best days/periods for meetings, calls, and other events. Use this form to report incidents of physical, verbal, social, or cyberbullying at our school, on school transportation, or at school events regardless of location. This short survey gives students the opportunity to share their feelings about their teachers, peers, and the school as a whole. This survey allows teachers to report access to technology in their classrooms. This short survey for teachers identifies the supports and challenges they face when integrating technology into their instruction. Participants may use this form to evaluate a workshop or other PD session they participated in. Figure 6. Sample pages from surveys included in the Survey Library.